So on occasion I crave a little simple pleasure like pizza. For lunch though it can be so high in calories to get something truly tasty. My taste in pizza tends to run pretty simple…I like garlic, I like pepperoni, bring it on! Really simple, a whole wheat pita, some low fat low cal pizza toppings such as turkey bites instead of pepperoni, and the broiler setting on the oven…then…tada! Tasty has been achieved. I even used a pizza cutter to cut mine into slices. 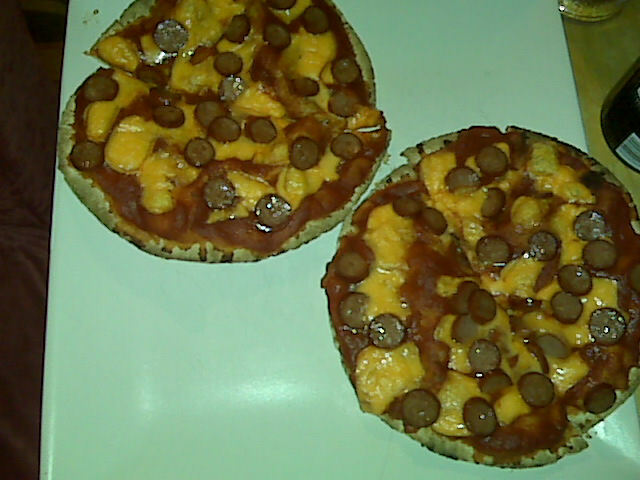 My pizza that you see here came to 260 calories per saucy pita. The trick is to watch and measure each of your ingredients…you will be surprised just how far 1/4 cup of tomato sauce and one ounce of cheese will take you. It helps that you get one serving of veggie from that tomato sauce too! Serve this with a tasty side salad and you have yourself a really tasty lunch that leaves you satisfied and full of veggies! Took me all of 5 minutes to make and bake….and no annoying kid claimed that they helped heh. This entry was posted in Craving Buster, Lunch and tagged craving. Bookmark the permalink.